TOKYO -- An American sailor whose disappearance at sea last week prompted a search by American and Japanese ships of thousands of square miles (square kilometers) of ocean was found alive onboard his ship on Thursday, the U.S. Navy said. The U.S. 7th Fleet said the circumstances surrounding the disappearance of Peter Mims of Interlachen, Florida, were being investigated. It said Mims would be transferred to another ship for a medical evaluation and recommendations for follow-on care. 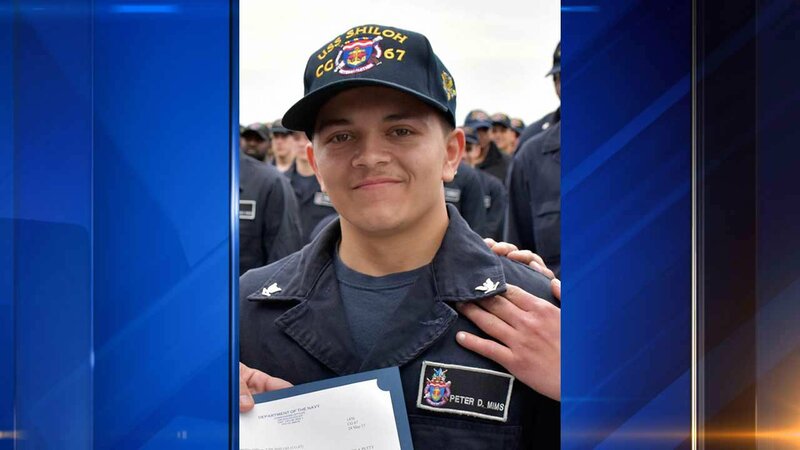 In a statement, the Navy did not comment on Mims' condition or say where he was found on his ship, the guided missile cruiser USS Shiloh. Mims disappeared last Thursday when the ship was in Japan's southern waters and was believed to have fallen into the sea. A search was suspended Sunday after more than 50 hours of effort by the U.S. and Japanese navies and Japan's coast guard. The Navy said a search onboard the Shiloh continued, and Mims was located on Thursday. "We are thankful to have found our missing shipmate and appreciate all the hard work of our sailors and Japanese partners in searching for him," Rear Adm. Charles Williams, commander, Carrier Strike Group 5 and Task Force 70, said in the statement. Mims enlisted in 2014 and reported to the Shiloh in August that year.